Here we have a few of many beautiful wines that would sit marvelously at your Thanksgiving table. As Thanksgiving nears I wanted to share some great wines from our Pacific Northwest region that I would recommend to pair with turkey. I’ve had the chance to review more than a thousand wines from the Pacific Northwest so far this year and with my sommelier background I have some enticing pairings in store for you. Pairing Northwest wines with turkey is actually quite easy. Since people choose a cornucopia of side dishes at their Thanksgiving table, I thought it would be most helpful for the turkey pairing recommendation and explaining why it works well. 2015 Argyle ‘Brut’ Sparkling Wine (WWB, 92)- This is viscous and lithe at the same time with marvelous tree fruit flavors and a buttery finish that will complement nicely both turkey and rich sides. 2015 Willamette Valley Vineyards ‘Brut’ Sparkling Wine (WWB, 91)- What I love most about this pairing is not only the weight and tension but lovely saline streak that pairs well with salted side dishes. 2014 ROCO Wines ‘RMS’ Sparkling Wine (WWB, 94)- Winemaker Rollin Soles is a master of crafting marvelous sparkling wine. This one is truly one of the best in North America, with serious weight and verve that will stand up to any rich bird. 2017 Big Table Farm Rose (WWB, 93)- This works well with the beautiful red fruits and weight of the wine that comes from the barrel aging that they do. The light red fruits also will marvelously complement cranberry sauce. 2017 DeLille Cellars Rose (WWB, 93)- This wine was the joint top-scoring wine from my 2018 Rose Report. It is rich, showing a wonderful texture. That will stand up to turkey really well. 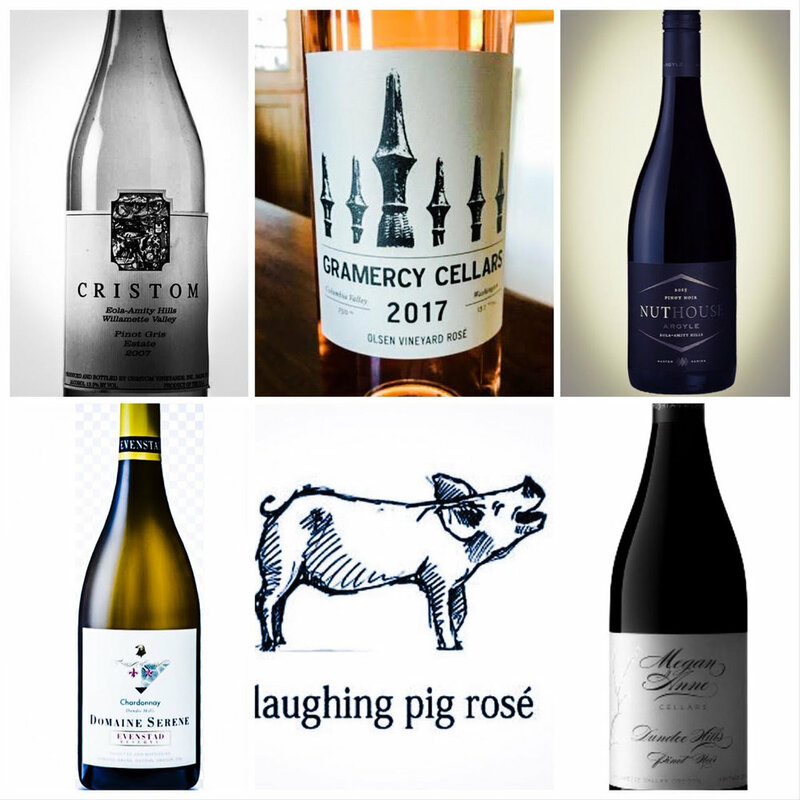 2017 Gramercy Cellars Rose (WWB, 92)- Again, the textural elements of the scintillating Rose match well with turkey. I love the weight and minerality of this gorgeous wine. 2017 Cristom Pinot Gris (WWB, 92)- This is one of the great Pinot Gris wines that I have sampled in the past year, with tremendous weight and beautiful tree fruit flavors that stand up well to any bird. 2016 Domaine Serene ‘Evenstad Reserve’ Chardonnay (WWB, 95)- This downright stunner of a Chardonnay has a marvelous mouthfeel and complements any buttery side dish (rich stuffing, mashed potatoes etc.). 2016 Kerloo Cellars ‘Celilo Vineyard’ Chardonnay (WWB, 91)- Winemaker Ryan Crane makes some of the best Chardonnay in the state. This effort is earthy and Burgundian but finishes with some nice butter and cream. It is well-poised and works well with cutting through any buttery side dishes. 2016 Argyle ‘Nuthouse’ Pinot Noir (WWB, 94)- This is one of the best Nuthouse Pinots I have sampled in the past fifteen years. It is earthy, fruity and has marvelous texture, as this versatile Pinot will match not only the weight of the bird but the acidity will cut through any creamy side. 2016 Knudsen Vineyards Pinot Noir (WWB, 92)- I love the earthy aspects of this great Pinot Noir but this, too, has the weight to stand up to turkey. 2016 Megan Anne Cellars ‘Dundee Hills’ Pinot Noir (WWB, 92)- Megan Anne Cellars is an Oregon winery founded by famed Washington winemaker, Mark Ryan McNeilly. This new edition is jam packed with rich dark fruits and earthy terroir. The combination of weight and earthy tones matches this marvelously with not only the turkey but earth-driven mushroom dishes.